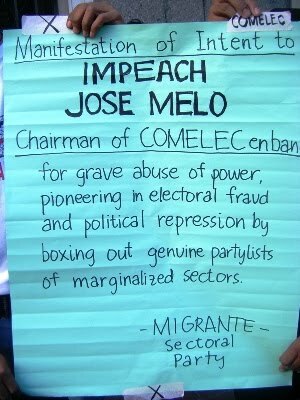 On the first day of the filing of certificates of candidacy and of party-lists’ manifestations of intent to participate in the 2010 elections, Migrante members carried a mock coffin that symbolizes the poll body’s ‘killing’ of the Filipino migrants and their families’ dream of congressional representation through the party-list system. “It’s official. The Arroyo regime, through the COMELEC, has fastened the last nail in the coffin of Overseas Filipino Workers and their families’ dream of finally having genuine representation in government,” said Migrante Sectoral Party Chairperson Connie Bragas-Regalado. “We are demanding to have Chairman Jose Melo and the rest of the Commissioners dismissed for disenfranchising millions of OFWs,” she added. The group also declared that they are set to confront the COMELEC ruling head on, and later trooped to the Supreme Court to seek a temporary restraining order (TRO) against the COMELEC ruling. “OFWs and their families deserve to have a say in government and are determined to fulfill this long sought dream. We are prepared to make sure that our call for genuine representation will reverberate not only in the Philippines but throughout the world,” Regalado said, as she revealed that protest actions are already underway in various Migrante chapters worldwide. She warned that OFWs are even contemplating withholding their hard-earned remittances for a day in protest of Migrante’s delisting. In its petition to the Supreme Court, Migrante said that COMELEC’s decision upholding Migrante’s de-listing is illegal and violates the Party-list System Act. The COMELEC, in its November 17 decision, said that due process was accorded Migrante and 25 other de-listed party-lists by allowing them to file verified oppositions. It also cited a 2007 Supreme Court minute resolution of Minero vs. COMELEC, wherein failure to participate in the elections was equated with failure to get 2% of total party-list votes. Migrante’s legal counsel is positive that the Supreme Court will act favorably on Migrante’s petition. “The high court has proven, through its abandonment of the first-party rule earlier this year, that any doubt on the interpretation of the Party-List System Act must be resolved in favor of recognizing the spirit and wisdom of the said law, which is to give representation the marginalized, such as OFWs,” Matibag said. He assailed that it took 22 days for the COMELEC to resolve Migrante’s verified opposition, and that it was delivered to the group only on November 19. “Such a delay has greatly limited the period available to the Supreme Court to resolve Migrante’s application for a TRO before the December 1 deadline of the filing of the manifestation of the intent to participate in the elections,” said Matibag. Meanwhile, Regalado pointed out that the poll body allowed five party-list groups (Visayas Farmers Party, Sagip Kapwa Foundation Inc., Visayan Association of the Philippines, Pinoy Overseas Party and Barangay Association for National Advancement and Transparency) to participate in the 2004 elections, even if they failed to obtain 2% of the total party-list votes in 1998 and did not participate in the 2001 elections.